Sidewalk Dining at È Tutto Qua – A little Italy in San Francisco, CA – Hello, it's Joe. In October 2015, my siblings planned a trip up to San Francisco, CA to support my sister who was competing in the Nike Half Marathon. The night before the race, we needed to find a place to carb her up and E’Tutto Qua seemed like the perfect place. Our only concern was the wait, so we called earlier in the afternoon to make a reservation for 8:00PM. It ended up being more around 8:30PM since it was PACKED inside when we arrived on time, so the restaurant had to set up tables outside. There were a few other parties with the same reservation time that waited as well. People walking up were given 1+hour wait estimates, so though they may be late with reservations, you should make one anyway! After checking in with the host, who seemed to also be the occasional busboy, we waited about 30 minutes before getting seated outside at a table on the sidewalk. My sister and brother-in-law just got back from a trip in Europe and said it felt like their first night in Italy, eating dinner outside with tables haphazardly set up, late night with lit candles. The tables were all close together, too, so it was actually kinda cool! Though the service was friendly and all around pretty suave, we did have to wait a while for: 1. bread 2. waters 3. entrees. But I didn’t mind any of that much since I was in good company. On top of that, we were seated right outside the kitchen window, so we could hear the cooks inside laughing and singing. The atmosphere here was phenomenal. It’s packed, but it’s familial. I wasn’t hangry, annoyed or stressed and was relaxed despite the lack of personal space and unexpected sidewalk encounter; the servers did a great job of making sure we were tended to, and understood we waited. The owner walked around and made sure that each table was occupied in some way, so that was nice that he was involved. As for the most important thing… food. We ordered the crostini appetizer (and kinda wished we got the fresh burrata! ), and it was delicious. Plenty of melted cheese. For entrees, I decided on the special that day: saffron pappardelle with tomatoes, crab and scallops. The pappardelle was chewy and fresh, lots of flavor! The seafood was cooked just right and were still soft in texture. It came with a great light tomato sauce, so you know the star of the dish was the pasta itself. 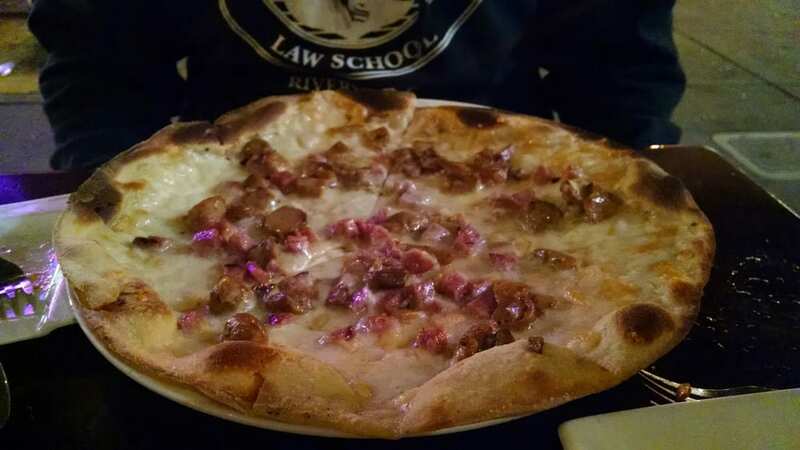 My brother got the porcini pizza with truffle oil…and this was ridiculously good. The truffle is strong with this one, but not overdone. Plenty of sausages and mushrooms all over, so you aren’t wanting more and the crust is flaky and soft. It’s thin crust, of course, but still a good size to share if you’re feeling the pizza route. My sister got the pappardelle with lamb ragu, because she’s a lamb fan. 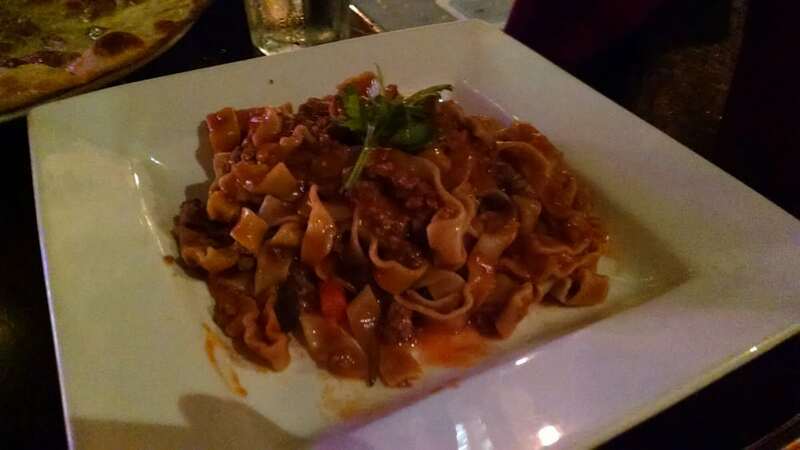 It starred the same fresh pappardelle as my dish, but with a simple tomato sauce with ground lamb. She loved it. All of our portions were large and we were VERY satisfied with our entire experience. The servers checked on us often, the food was great and the atmosphere was incomparable. Made me feel like I wasn’t in San Francisco, rather enjoying a meal at small restaurant on the streets of Italy. Great place! Bring a date, family or friends and share a great meal and experience!